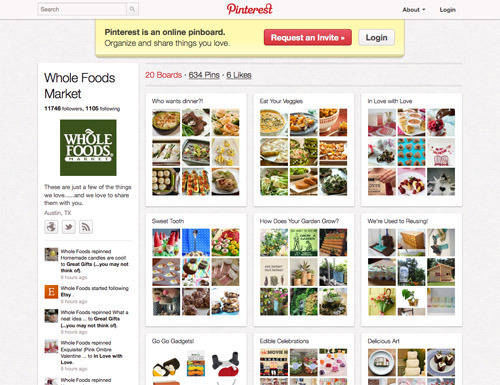 Business is booming on Pinterest. 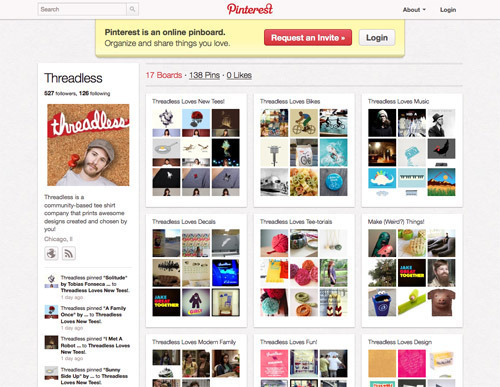 According to data from Monetate, a testing and personalization firm, from September to December 2011 estimated unique visitors to Pinterest.com increased by 429 percent. Total same-store referral traffic from Pinterest to five specialty apparel retailers rose 389 percent from July to December 2011. Here is a list of brands on Pinterest. There are both established and emerging brands, engaging large and small audiences in different ways. If you want to make it easy for customers to share your products on Pinterest, add a Pin It button to your product images. Etsy is a marketplace for vibrant handmade and vintage merchandise. 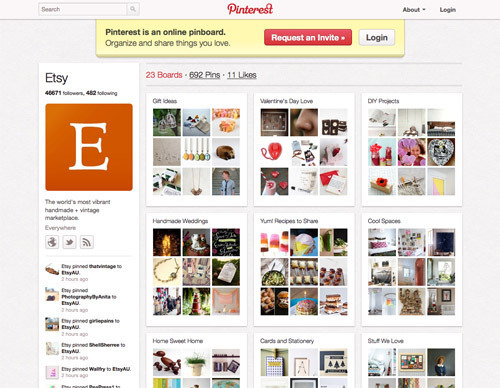 In January, Etsy added Pinterest’s Pin It button on Etsy listing pages, alongside the Tweet and Like buttons. Etsy on Pinterest has over 46 thousand followers. It has 22 boards that feature products from its marketplace. Boards include Gift Ideas, DIY Projects, Fashion, Cool Spaces, Stuff We Love, and Etsy Kids. ModCloth.com is an online clothing, accessories, and decor retailer of vintage and retro styling. It seeks to provide a fun and engaging social shopping atmosphere for its customers. 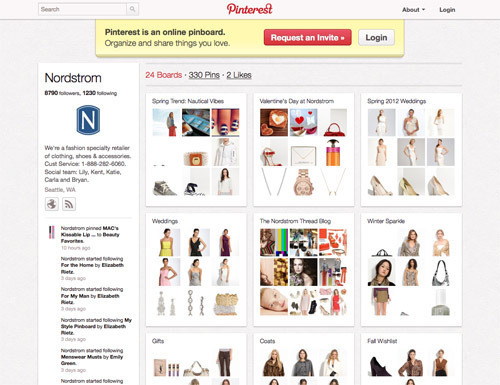 ModCloth on Pinterest does not directly post its products on to any specific board. Instead it generates a creative mix of inspirational elements from a wide variety of sources, which are then shared across many social circles. 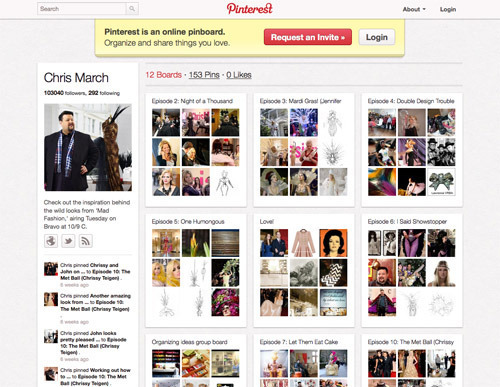 There’s even a Guest Pinner Gallery, a user-generated pinboard. 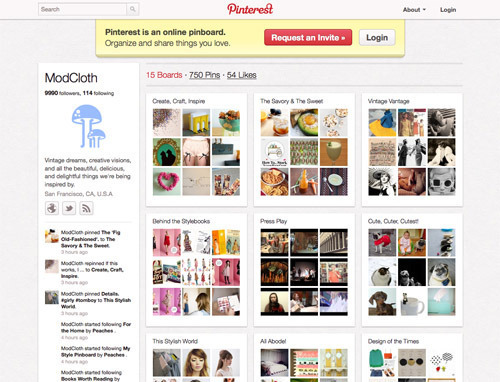 ModCloth has nearly 10 thousand followers on Pinterest. General Electric does not immediately leap to mind when one thinks of Pinterest. 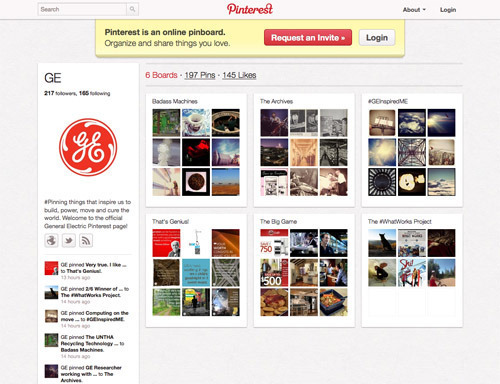 However General Electric on Pinterest highlights the industrial conglomerate’s legacy of design. Its boards also display items of inspiration. There’s even a Badass Machines board for cool machines in action. While GE only has around 200 followers on Pinterest, it’s embracing the spirit of the site, and its progress is worth watching. Whole Foods Market on Pinterest. Whole Foods Market on Pinterest has over 11 thousand followers. It is a great example of a brand that frequently re-pins other users’ pins, reflecting the interests of its followers and embracing the social-sharing aspect of Pinterest. Its 20 boards include Delicious Art, Whole Foods Foundation, Strength, We’re Used to Reusing, and Super HOT Kitchens. West Elm is a home décor retailer with a focus on clean and simple modern design. 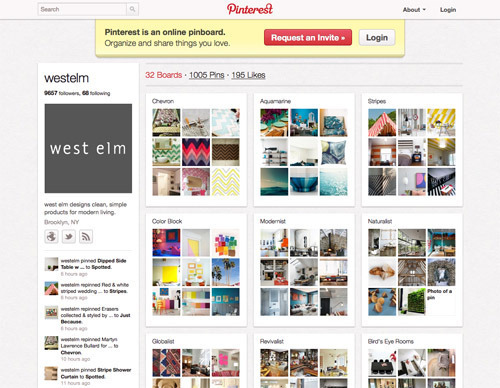 West Elm on Pinterest has over 9 thousand followers, but many of its 32 boards have over 14 thousand followers. Its boards are based on simple design concepts, such as Faceted or Pattern. The boards feature design from many different sources and display a large number of re-pins. Paula Deen is a celebrity chef. 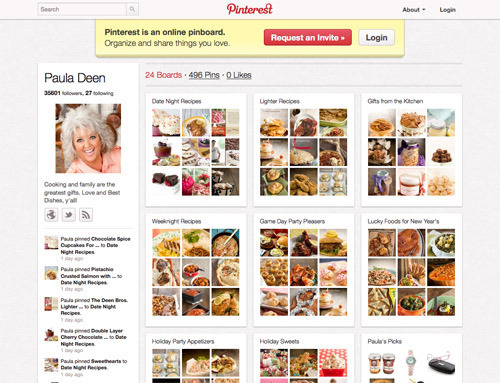 Paula Deen on Pinterest has over 35 thousand followers. It showcases recipes on boards like Date Night Recipes and Weeknight Recipes. The recipes are originally from her website. There is also a Paula’s Picks board that displays items from PaulaDeenStore.com. Nordstrom is a specialty retailer of clothing, shoes and accessories. Nordstrom on Pinterest has close to 9 thousand followers. It has 24 boards that group its merchandise in different themes, such as Weddings, Coats, Gifts, Fall Wishlist, and Top Trend. Peapod is an online grocer. 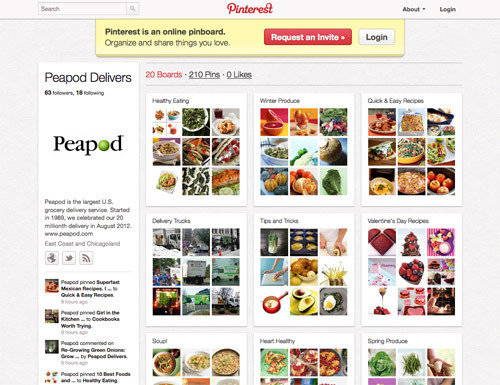 Peapod on Pinterest has 20 boards. Many are about food groups and recipes, such as its Soup! or Spring Produce boards. The content is re-pinned from a wide variety of sites. There is even a Delivery Trucks board showing photos, many taken by customers, of Peapod trucks in action. Minted is an online store that sells invitations and paper goods from a community of independent graphic designers. 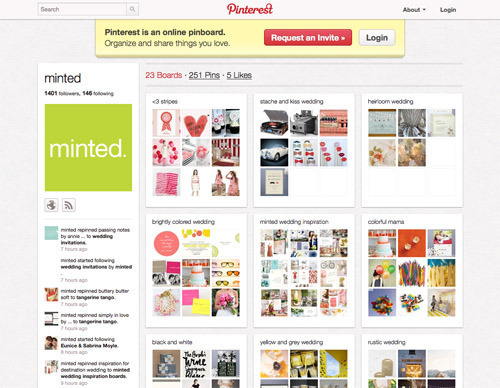 Minted on Pinterest has 23 boards that focus on event themes, such as a rustic wedding or a dinner party. Along with featuring Minted paper goods, the boards display inspirational items for events, such as recipes, dress ideas, or just inspiring color design. Chris March is a designer and host of Bravo TV’S Mad Fashion. Chris March on Pinterest has over 100 thousand followers. Boards feature designer inspiration and final looks from each episode. Boards usually go up immediately after an episode airs. Real Simple is a magazine that gives creative, practical and inspiring solutions to make life easier. 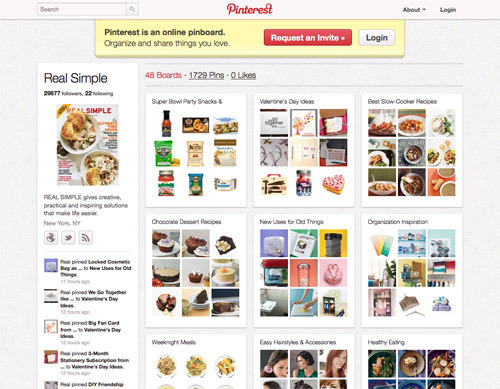 Real Simple on Pinterest has nearly 30 thousand followers. Nearly all of the content is pinned from the magazine’s website. Cabot Cheese is a family-owned farm cooperative that produces all-natural cheeses. 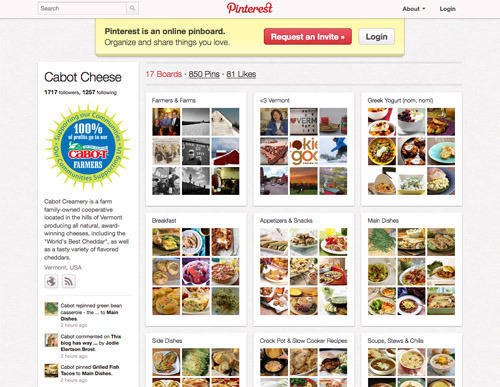 Cabot Cheese on Pinterest has nearly 2 thousand followers. Its boards feature meals and courses where cheese may be eaten, as well as farms and cheese production. Recipes and cheese-inspirational items are from many different sites. Katherine A (happysolez) on Pinterest. Katherine Accettura of Happy Solez makes clothing and accessories for women and babies. 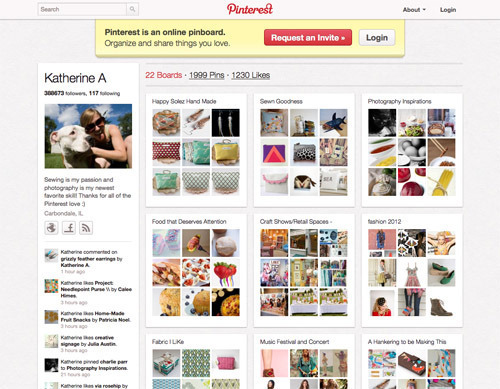 Katherine A (happysolez) on Pinterest has 388 thousand followers. Her Happy Solez Hand Made board has 735 thousand followers. In addition to showing her own work, the boards feature lifestyle and design topics, like Fabric I Like, Travel, Graphic Design, Food that Deserves Attention, and Fashion 2012. Threadless is a t-shirt company with an open call for design submissions, which are then voted on by community members. Threadless on Pinterest has a Threadless Loves New Tees! board that display its new tee designs released each week. Other boards are about things Threadless loves, like bikes, music decals, making weird things, and tee-torials.